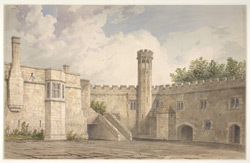 The Vernon family acquired the land around Haddon Hall in 1170. It originally consisted of a defensive tower surrounded by a high wall, but as the family fortune grew, so too did the house. The greater part of the Hall was built in the 14th and 15th centuries and much of the fine interior craftwork still exists. A bridge was built over the River Wye in the 16th century which gave access to the house from the other side of the valley. The gardens were formally landscaped in the 17th century, but by 1703 the house had to be abandoned due to lack of funds for its renovation. The house lay empty until the 1920s when the ninth Duke of Rutland moved into the Hall and restored it to its former glory.